A project undertaken by the Archbishop Dr. Emmanuel ST Louis (FADRESL) Foundation. The project objective is to reintegrate street children into the public education system. For these children, access to school will provide a better future. The majority of the participating children come from dysfunctional and or violent families. Many have been excluded from the educational system because of absenteeism or because of low income families. These children are often victims of exploitation and child labour. Other forms of discrimination or ill-treatment. Many are forced to live on the streets. 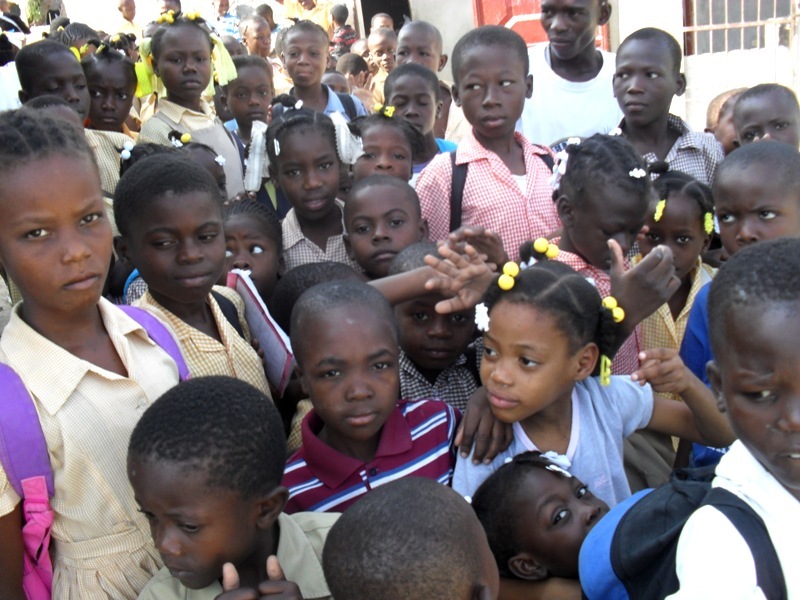 Since the month of January 2009, 60 of “The Haiti children friendly schools” have been established across Haiti, 20 of which are funded by the Foundation Archbishop Dr. Emmanuel ST Louis (FADRESL). This project gives to the street children the opportunity of better future. Similar activities are now planned in several departments of the Republic of Haiti even at the border. Students enrolled in the “friendly schools for children in difficulty in Haiti” multi levels and innovative follow a specially developed curriculum and also receive learning methods adapted to their needs. This project comes in addition to the action of the Haitian Government seeking to encourage these children to re-enter the school system. In addition, free LINASPHADESNA meals and the distribution of clean clothes promote attendance. and follows a curriculum tailored to the children of the streets. • All teachers involved in the project are paid by the Ministry of Education and trained by the complex of FADRESL vocational training Centre. • The project “Friendly schools for children in difficulty in Haiti” has been integrated in the Haitian official education system. Thus, all children enrolled in school have access to public reviews and official diplomas. FADRESL – FOUNDATION ARCHBISHOP DR. EMMANUEL ST-LOUIS. FADRESL’s love for God guides its mission for positive change of conditions of life for the poor, and for victims of all kinds. The foundation is working towards sustainable development of communities and the promotion real transformation of those communities. • Get involved in the struggle for economic, social and cultural justice and help turn the man in the relationship with the other. • Increase the capacity of a community and its members to control their lives, their social, cultural and economic environment for better integration and autonomy. • Protect the name and image of the Archbishop Dr. EMMANUEL ST-LOUIS, against any commercial use or advertising not consistent with his thinking and his work. By delegation of the Archbishop Dr. EMMANUEL ST-LOUIS, the Foundation is also empowered to authorize agencies, commercial and non profit, to use the name and the image of the Archbishop to contribute to the financing of a humanitarian organization, under the terms of the mandate given by the Archbishop Dr. EMMANUEL ST-LOUIS to this organization, more specifically, but not exclusively, to children and their families in countries in the process of development. An example of this would be the solidarity actions initiated and implemented by the Archbishop Dr. EMMANUEL ST-LOUIS in the slums of Haiti. In accordance with her wishes, priority is given to the sustainability of the actions launched by the Archbishop Dr. EMMANUEL ST LOUIS for ‘rag of Haiti’ and children moved to the border with the Dominican Republic. The foundation is head quartered at crossroads. However it is possible it may be moved in the near future. 1 To Work primarily in partnership with local associations and representatives of local initiatives. 5 To Create and share information materials, the life of the Foundation. 6To disseminate information on work related to the actions of the Foundation and the work of the ST-LOUIS Archbishop Dr. EMMANUEL, literary. The Foundation consists of honorary members, of members’ benefactors, active member s and acceding members. Archbishop Dr. EMMANUEL ST-LOUIS, founder who continues his work on all the territories within Haiti as well as external to Haiti. The quality of benefactor members may be granted by the Board of Directors to individuals who have rendered services reported to the Foundation. Active membership may be awarded by the Council to the people who contribute significantly to the life of the Foundation. The title of honorary member, benefactor member or active member provides to persons who have obtained it, the right to take part in the Assembly with voting, without being required to pay a fee. Members are persons who have paid their dues. Annual dues shall be fixed each year by the General Assembly. A special rate May be provided for legal persons. Establish a Social Justice and economic, policy as well as an ecological policy particularly in the territories of the Republic of Haiti, in accordance with the fundamental moral codes and scientific techniques of organization. Meeting academics to advance and gain a deeper understanding of societies, at the national and international Government and Non government organizations, as well as family, marriage and its connection with the expansion of the individual in society. Promote reconciliation and universal peace through dialogue with all the Nations and international basic codes. Research, Legal Protection, the defence of human rights and security. A, Being a living human being enjoying civil and political rights. C, Accept and respect these statutes and internal regulations. It is an organization open to all those who, under conditions provided for in these regulations, aspire to membership following the established categories. (c) Honorary members are those who use their influence and reputation to further the objectives of the organization as well as bring their technical and financial assistance to the organization. The admission of a member Executive Committee requires the consent of all the founding members. After each General Assembly when a new Executive Committee is elected, the President will issue membership cards to all persons who are an integral part of the organization. (B) Prepare the budget and the work program for the organization. (C) Develop different activities aimed at the development of the members of the FADRESL and to improve the service to the national and international communities. The assembly consists of a number of economists, male cleric, LawyersEct. PRESIDENT ARCHBISHOP DR EMMANUEL ST LOUIS.